Alumni Picnic – September 17th! Join us on Sunday, September 17th at the Main Pavilion in Cook Park for our Alumni Picnic! From noon to 3pm we will be serving great food and celebrating Peppertree dogs! 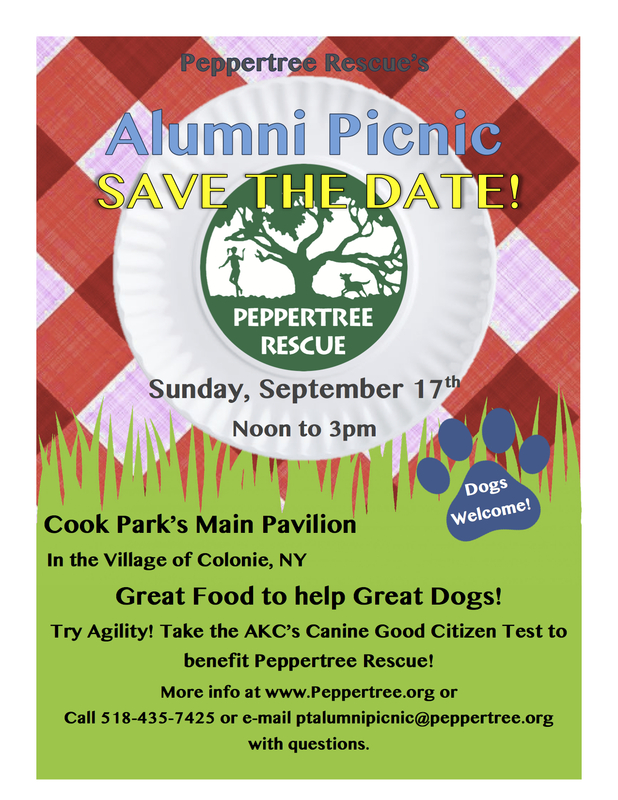 You do not have to have a Peppertree dog or be a Peppertree adopter to attend, all are welcome! While it is not required if you are coming please e-mail ptalumnipicnic@peppertree.com to RSVP so we can help estimate how much food to buy. Good Choice Dog Training will be there with the chance for your dogs to try out agility, and Old Dogs New Tricks Dog Training will be conducting a Canine Good Citizen test with the entry fee benefiting Peppertree. E-mail olddogsnewtricksdogtraining@yahoo.com to sign up for the test or questions on what your dog will need to know.